Conveniently located on Cook drive, you are within a gentle stroll from the beach and shops, no need to drive and battle for parking in the peak holiday periods. Just a couple of doors down from the Lost Spring a luxury thermal pool and day spa, with a cafe for great food and coffee. Lots of golf courses in the surrounding areas making it ideal for girl / boys or couples weekends or getaways! Well maintained with mod cons and comfortable furnishings to enable you to just arrive and enjoy. Great layout with 2 bedrooms and a bathroom on both levels, a lounge upstairs and a rumpus downstairs for giving it the ability for two families or groups of friends to have their own spaces. A third bathroom in the garage for a shower on return from beach or fishing. Plenty of off road parking for cars and boat and an outdoor filleting bench with a functioning sink. The rumpus room contains a table tennis table, their are tennis rackets, golf clubs and lots of board games to keep kids (and adults) entertained and plenty of room for the kids to run around on the front lawn. Well set up for toddlers with a fully secured lawn area out the back so you can relax while they play! Contains half sized bath and a clean portacot so you don't have to bring the kitchen sink. We have such a great stay. Plenty of rooms and space with a deck and bbq out the back! Had everything we needed kitchen is well equipped! No WIFI which I actually liked because it kept everyone off their phones and we really enjoyed the moment! The floors creek a bit which I felt a bit sorry for the people downstairs but it wasn’t too bad! It’s just such a lovely property, so close to town which was really handy and right next to the Lost Springs which we walked too. We all said we would definitely stay again for sure! Huge front yard so plenty of parking for the boat etc! Can’t recommend it enough! Thanks so much for a wonderful stay we will be back! Kym was also easy to communicate with and made the whole process a breeze! I would have no hesitation in recommending this place. 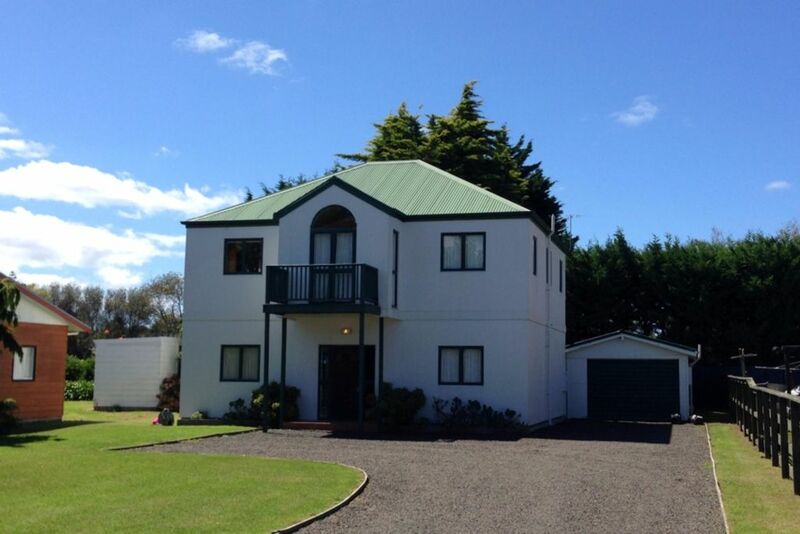 Perfectly central Coromandel location, handy to beach and amenities. Owners were excellent. For four sisters with four kids aged (3, 7, 9 & 13) the bedroom upstairs/downstairs configuration was excellent. A games room and also a games cupboard upstairs were all used. Kids asked if there was internet and I said I didn’t know, but there was so much to do, we never turned on the TV or found the need for internet more than our mobiles. Although utensils drawer was overstocked, the open plan kitchen and small dining gave room for all of us to work together. 8 fitted comfortably around the outdoor table so it was fab except in the heat of the morning sun. Could do with an umbrella for this. Three doors away from pampering at the Lost Springs was perfect, and location to beach for early morning walks and boogie boarding worked well. All things we wanted to travel to were less than 30 mins drive; and so close to Whitianga for shopping. Thanks for everything. We would definitely return and recommend it. GREAT location, very close to beach, shops, everything. Large house, with lots of space for 2 (or 3 small( families), new bathrooms, no complaints. Cooks cottage fitted our stay perfectly. It was a great size for fitting our large family. Child friendly with all the gear to match ie highchair, safety gate at the top of the stairs. I loved that there weren't any bunks to contend with. Fantastic having 2 big lounges so everyone isn't on top of each other all the time. Only down side was no pantry for food. Would definitely recommend to anyone with large families. We had a fantastic stay thank you!! !